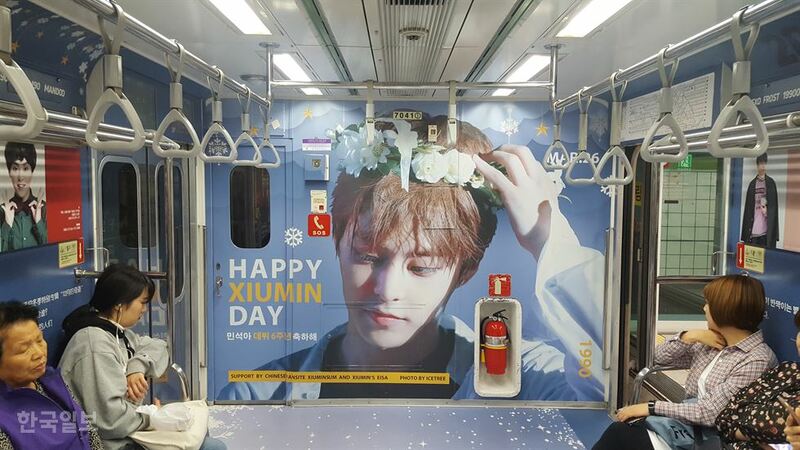 Almost 8 million people pass through Seoul's subway system every day, exposing themselves to ads placed above train seats, on the safety barriers next to the tracks and on various other flat surfaces throughout the stations. Seoul Metro, the operator of the capital's subway lines, is planning to adopt a clearer selection standard for the ads posted in its trains and at stations, after it came under fire recently for "arbitrarily" allowing or banning certain politically charged content from advertising spaces. "In the beginning of September, we will announce whether to accept opinion-based ads again, as well as specific standards for filtering such ads," a Seoul Metro official told The Korea Times, Tuesday. Without clear standards, Seoul Metro has taken an arbitrary stance on ads carrying sensitive topics. In May, it rejected an ad request about gender equality by a feminist group at Sookmyung Women's University. In June, Seoul Metro also rejected a request to host an ad supporting the Panmunjeom Declaration, signed between North and South Korean leaders in April as a symbol of growing peace overtures on the Korean Peninsula. Earlier this year, however, it allowed President Moon Jae-in's fans to put up a birthday celebration ad for the incumbent President. As controversy emerged over the confusing selection, Seoul Metro in June chose to simply ban all ads "containing opinions on social problems or issues regarding gender, politics and religion." As a response to public criticism of the blanket ban on all opinion-based ads, Seoul Metro CEO Kim Tae-ho also said on Facebook on July 5, "The metro is a space for providing comfortable transport, not a space for controversial debate." Faced with criticism over its "lack of tolerance" for social issues in its advertising spaces, the subway operator expanded its six-member ad selection committee recently by adding two "experts" on gender and human rights issues. It plans to set the new standard in a meeting next month. However, it refused to release any details such as names or prior positions of these new members which could be used to verify their expertise. The lack of transparency has raised doubts about Seoul Metro's sincerity. "A committee cannot ensure its objectivity without revealing information about its members," Hwang Chul-woo, a senior member at Seoul Metro Labor Union, told The Korea Times. "I think citizens and civic groups should be allowed to participate in the committee to set rules for selecting ads with the public interest in mind." Hwang also said Seoul Metro has been taking a less-than-active stance on the problem. "Its stance on the ad controversy so far has been very bureaucratic, just showing emergency cover-up responses to every bout of criticism," he said.